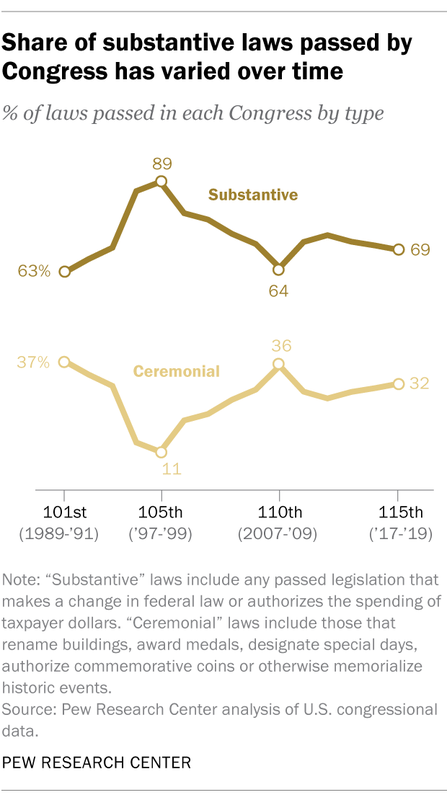 Looking back over the past 30 years, the 101st Congress (1989-1991) passed the most laws in total (650) and had the lowest percentage of substantive laws (63%). That’s because it, like many Congresses before, passed dozens of laws designating special observances – National Tap Dance Day, National Quarter Horse Week, National Library Card Sign-Up Month and the like. That practice diminished over the next few years and was largely ended by the 104th Congress in the mid-1990s. 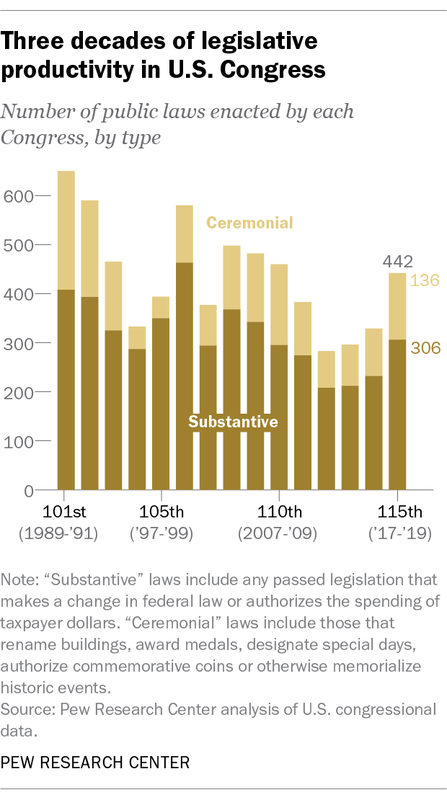 Since then, only one Congress has chalked up a lower share of substantive legislation than the just-ended 115th. That was the 110th, held after Democrats retook the House and Senate in the 2006 midterms during Republican George W. Bush’s final two years as president. Only 64% of the laws enacted by that Congress were substantive, by our reckoning. The 115th Congress, notably, ended without funding large chunks of the federal government for the current fiscal year (only five of the 12 regular appropriations bills were passed, in two separate omnibus packages). That, and the inability of Congress and President Donald Trump to agree on a temporary funding measure that either does or does not include money for his proposed border wall, led to an ongoing partial government shutdown. But the 115th was not entirely without accomplishment, though the overall share of substantive measures might suggest otherwise. Perhaps its most significant law was the $1.5 trillion Tax Cuts and Jobs Act, passed in December 2017. Besides reducing income taxes on individuals and businesses, the law repealed the tax intended to enforce the 2010 Affordable Care Act’s mandate that most Americans carry health insurance. 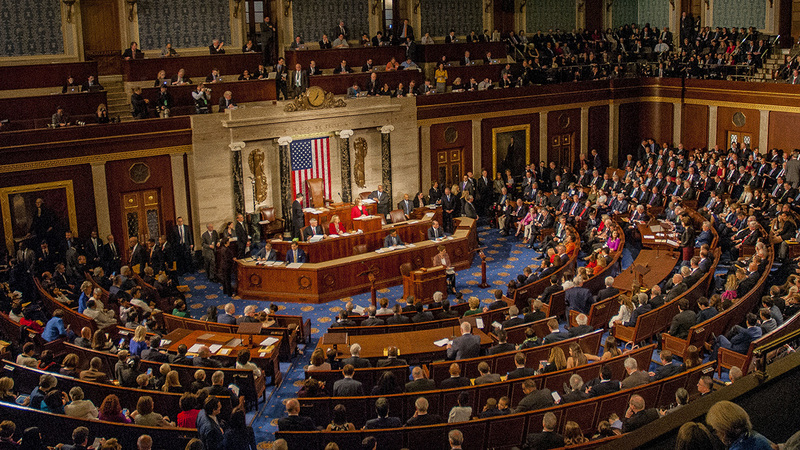 Other major legislation, much of it passed with bipartisan support, included the First Step Act, an overhaul of the federal criminal justice system; a new five-year farm bill; a law intended to address the opioid crisis by, among other things, expanding the availability of addiction treatment; the Music Modernization Act, which rewrote music copyright and royalty rules for the digital age; a sanctions bill targeting Russia, Iran and North Korea; a bill overhauling and extending veterans’ educational benefits; and the first comprehensive NASA authorization bill in more than six years. Note: This is an update of a post originally published Aug. 29, 2017.